We cater to Maryland, Virginia and West Virginia Brides. Frosted Fantasies will create a wedding cake that will take your breath away. 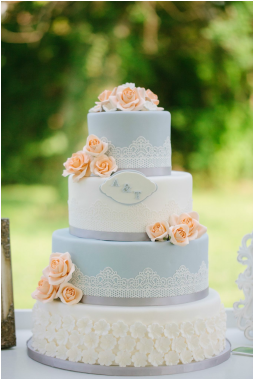 Frosted Fantasies works with each bride to create a unique and perfect custom cake. Brides don't forget your Groom! He deserves a special cake too. We will create a special themed cake just for him, such as a favorite sports team, golf or hobby cake. Wedding cakes start for most designs with a $500 minimum for a three tier cake with no additional cost for applying a very thin layer of our delicious vanilla marshmallow fondant. We also offer an anniversary cupcake at no cost, it's our special gift to you and you wont waste servings on your wedding cake. Call today for a quote! Please remember- a non refundable $100 deposit is required to hold your date. Frosted Fantasies offers tastings, please call to book your appointment today! Please bring all questions, ideas and pictures so we can discuss design. Tastings are held on Sundays.